Today at The Football Fan Spot we have Western Illinois cornerback and NFL Draft Prospect, Patrick Stoudamire. He made the Division I-AA All-American 2nd team last year and made the All-Missouri Valley Conference first team in each of the last 3 years. He is regarded, for the most part, as a 4th-6th round prospect. A merchant cash advance is something that we will not see in Stoudamire’s immediate future, his prospects as an NFL player looks like a good one! Today he has come around to talk to us about his experience playing this game and his Pre-Draft thoughts. The Football Fan Spot: You played last year in Division I-AA. How do you think playing in Division I-AA compares to playing in Division I? Would you say it’s a bit of a disadvantage coming from a smaller school background as you try to transition to the NFL? Patrick Stoudamire: I believe the only thing that is different between D1-AA and D1-A is the front 7, because it is shown in the past that D1-AA and smaller are actually producing well in the NFL. I believe if you can lock up a receiver at D1-AA you can in D1-A. I showed that in the East-West game and practices. The only disadvantage I would say is the quarterbacks in D1-AA do not throw at a good corner but the D1-A school quarterbacks do over and over which allows those corners to rack up INTs and pass break-ups, and also a lot of passes caught and scored on. But the transition into the NFL is always going to be a shocker just like it was to become a collegiate player. The speed and the strength and crisp routes by the receivers and the arm accuracy and strength and power of the quarterbacks all improve. TFFS: You got a chance to play in the East-West shrine game despite your small school background. What was that experience like? PS: The experience of the East/West game was a once in the life time experience because of the kids, visiting the hospital was very life changing, we were running so those kids can walk. And on the football aspect it was great because I got to go against the best, Freddie Barnes and Blair White in practice everyday and showing the scouts that I can guard whoever is in front of me. TFFS: Do you think you did a good job of showing what kind of pro you could be to the scouts watching or were there a few things you wish you could have done differently? PS: I hope I grabbed the attention of the scouts even if it was only one because all it takes is one. TFFS: Which players at the East/West game, either on your team or the opposing team, really impressed you most? PS: Blair White impressed me the most. His routes were very crisp and he was faster and more quicker than I thought. TFFS: You didn’t get a chance to work out at the Combine, but you have a Pro Day coming up. How have you been preparing for that? PS: Even though I didn’t get an invite to the combine, I still went on my way to train even harder to prove that I should have and I have been working out at Perfect Competition with Auto Bolden as my speed coach and Brain Martin and his crew. Now I am working on my starts to better my 40. TFFS: Who do you compare yourself most to in the NFL? Is there anyone you model your game after? PS: Champ Bailey, a lock down corner and my style of play is like Nnamdi Asomugha he is just so dominant out there. TFFS: A little bit of background stuff, when did you start playing football? Who did were some of your favorite players to watch as a kid? Favorite team to watch? PS: I started playing football in 4th grade I believe. The earlier years were just for fun, started out in flag. My favorite players as a kid were Brett Favre and Champ Bailey. My favorite team was Green Bay with Brett Favre, Antonio Freeman, Reggie White, and Dorsey Levens. Beast team. TFFS: When did you first realize that you had a really got shot at the NFL? PS: I realized my sophomore year that I had a great chance in playing in the NFL so I gave up playing basketball. I did play two sports my freshman year that is why I went to WIU and not a bigger school. TFFS: Give me a little bit of a self scouting report, what do you say you could contribute most to an NFL team? What is your biggest weakness or thing you need to work on most? PS: A very good sized corner with speed and the determination to do what it takes to get the job done. The biggest thing I need to work on and can always improve is driving through the receiver, which I worked on a lot in the East/West Shrine game/practice. TFFS: Which, if any, NFL teams have contacted you up to this point? PS: I talked with the Bears, Jaguars, Falcons, Patriots, Redskins, Buccaneers, Panthers, just to name a few. TFFS: Your former teammate, Jason Williams, was a 3rd round pick of the Dallas Cowboys last year. Have you been keeping in contact with him throughout this Pre-Draft process and if so, what has he told you and how has he helped you? PS: Yes, Jason is a close friend and he is always giving me advice throughout this process. He has gotten me ready to come into a business not just a sport. Another person who has helped me a lot was my mentor and my late cousin Chris Mims. He told me to always keep my body in the tubs and treat this like a business and go back to school and finish your degree because football is just the beginning and the leather ball will open doors for you that not many people even get the chance, so take every opportunity to listen to people who are successful. TFFS: One final question, if an NFL GM were standing right in front of you and asked you, why should we draft you, what would you say to him? PS: I am a reliable person, will do whatever it takes to get the job done and that you can rely on me. TFFS: Thanks again for doing this. Good luck in the NFL. Today at The Football Fan Spot we have New Hampshire tight end and NFL Draft Prospect, Scott Sicko. He made the Division I-AA All-American 2nd team last year and the Division I-AA All-American 1st team in 2008. He caught 160 passes in his college career, with all but two of those coming in the last 3 years. He is regarded, for the most part, as a 5th-6th round prospect. Today, he is here to tell us about his game and his Pre-NFL Draft experience. The Football Fan Spot: First, a little bit of background stuff, when did you start playing football? Who did were some of your favorite players to watch as a kid? Favorite team to watch? When did you first realize that you had a really good shot at the NFL? Scott Sicko: I started playing football very young. As long as I can remember I have been playing football. Not always in an organized setting but I remember as little kid playing with my father and the other kids around my house. When I was younger I never really had any favorite players, I always just like to watch the game. My favorite team when I was younger was the Raiders because that is who my father like so I grew up liking them, but now I like multiple teams. There are a lot of teams out their that I have a lot of respect for. TFFS: You played last year in Division I-AA. How do you think playing in Division I-AA compares to playing in Division I? Would you say it’s a bit of a disadvantage coming from a smaller school background as you try to transition to the NFL? SS: I honestly don’t know how to compare the two levels just because I haven’t played at both. I don’t know if coming from a D-1 AA will hurt me. I do know however that it will be a big change from college to profession and that I am going to work as hard as possible to make the best transition I can. TFFS: Throughout the season, you were listed anywhere from 235 pounds to 240, yet at your Pro Day weigh in you measured in at an impressive 6-5 251 and still managed to put up an impressive 40 time. How much do you think that affects your draft stock and how much of a priority was bulking up for you after the season? SS: Bulking up was a huge priority for me after the season. I knew that for teams to look seriously at me that I would have to be at least close to 250lbs if not over. As for how my 40 time affected my draft stock I really don’t know, I can just hope that it helps. TFFS: Its been roughly 3 months since the end of your season. Aside from the added bulk, do you think are an improved player since the end of the season and if so, in what way? TFFS: You didn’t get a Combine invite, but there were a lot of bigger school athletes that got Combine invites yet chose to skip a drill or multiple drills in favor of doing them at their Pro Day. As someone who did not get to attend at all, what do you think of that? SS: That is a situation in which those players have to do what they think is best for them and you can’t hold that against them. TFFS: Which, if any, NFL teams have contacted you up to this point? Which teams sent scouts to your Pro Day? SS: Multiple teams have been in contract with my agent. The Patriots and the Colts attended our Pro Day here at UNH. TFFS: How would you compare yourself to guys like Jermaine Gresham, Ed Dickson, and Aaron Hernandez? SS: All of those guys are very good players. I don’t think I would be able to compare myself to them, I usually leave the comparisons up to other people. TFFS: I have always found it very interesting to ask prospects what round they believe they will be drafted in, so, honestly, putting aside where you think you should be drafted, what draft range do you think you will be drafted in? SS: Honestly, I have no idea. That is one reason that this process is so exciting though. I mean, I have never been though this process before and I have only seen a couple of other players go though it and witnessed it from a distance. All I can do I work as hard as I can to perform to the best of my ability and hope that the teams like me. TFFS: A lot of rookies have to play significant amounts of time on special teams. What is your experience playing on special teams and did you enjoy it? SS: I have been a back up long snapper all of my 4 years at UNH and I have also been back up short snapper and was first string for a large part of my junior year. For me special teams are just another opportunity to get on the field and any chance you get to be on the field is great in my eyes. SS: I think that there are a lot of very good tight ends in the NFL. I really have never modeled my game directly after any players, but I always try to learn new thing from a variety of players. TFFS: Switching from you to your former team, what is one thing about New Hampshire Wildcat football that you would want the common fan to know? SS: I would want them to know the amount of work that UNH football players put in. We work incredibly hard here so we can go out a perform well and we take a great deal of pride in that. SS: I would tell him that I would do any amount of work that it took for me to help to contribute to the team in order for it to be successful. Today at The Football Fan Spot, we have Scott Wedige, a center prospect out of Northern Illinois. Wedige is a smaller school player, but stood out on Northern Illinois’ offensive line, making the All-MAC 1st team in 2010 and 2011. He blocked for Chandler Harnish, another potential draftable prospect, who was sacked a mere 23 times in the last 2 seasons. He’s expected to be a late round pick or a priority free agent. He has a bright future ahead of him. Today, he is here to tell us about his game and his Pre-NFL Draft experience. The Football Fan Spot:First, a little bit of background stuff, when did you start playing football? Who did were some of your favorite players to watch as a kid? Favorite team to watch? When did you first realize that you had a really good shot at the NFL? Scott Wedige: Been playing football since grade school. Favorite players growing up, Brett Favre and Reggie White. Favorite player now Jeff Saturday. Favorite team Green Bay. I never really knew I had a chance until I started getting calls from agents and it kind of never felt real until Pro Day and saw scouts meeting with me. TFFS: It’s been roughly 2 or 3 months since the end of your season. In what ways, if any, do you think you’ve improved since the end of the season? SW: I have improved my overall conditioning, strength as well as my athleticism. My trainer Kevin Barcal of Breakaway Athletics does a great job and pushes us farther than I thought I could. SW: I have heard anything from 5th-7th round as well as priority free agent. If I am drafted it will be a blessing and I have no idea where or when I will be drafted if at all. SW: I would say I like to model my game after my favorite player Jeff Saturday. He is an extremely intelligent player who plays hard and goes about things the right way on and off the field. TFFS: Which NFL players, if any, have been helping you as you transition to being an NFL player? SW: I have got to meet with Ryan Diem and Jeff Saturday to work out. Those guys taught me a ton and have been a guide for my transition from college to pro. My agent Cliff Brady has also been a mentor and a great friend through this entire process. TFFS: You didn’t get a chance to attend The Combine so your Pro Day was extremely important. Were you satisfied with your performance? Which drills do you think best displayed your abilities? SW: I was pleased with my numbers. I have done better in training but I ran a 5.1 40, 4.5 shuttle, 7.8 L drill and 25 bench reps. I think that the on field drills shows my football talents as well as how well I can move and bend. I think my pro agility displayed my quickness and flexibility. SW: I think that what I offer a team is an intelligent player that plays hard and has a great work ethic on and off the field. TFFS: Shifting from you to your team, what is one thing about Northern Illinois football you think the common fan should know? SW: NIU is a university with more pride and love surrounding it because we do thing the hard way and the right way. I am proud to be a Huskie. SW: If a GM was in front of me I would say that you are drafting a guy who has a great work ethic, a great student of the game, and nasty playing style who can help your club right away and I promise I won’t let you down. Today at The Football Fan Spot we have Tarleton State kicker and NFL Draft Prospect Garrett Lindholm. With a reputation for a strong leg, after hitting a 64 yarder last year and hitting 3 of 4 from 60 at his Pro Day, as well as nailing 47 touchbacks on 141 tries in the last 2 years, Lindholm could be the first kicker off the board in the 2010 NFL Draft, though he’ll have to beat out guys like Leigh Tiffin and Brett Swenson for the honor. His 64 yard field goal is tied for the 3rd longest field goal made in NCAA history. Today, he is here to tell us about his game and his Pre-NFL Draft experience. The Football Fan Spot: First, a little bit of background stuff, when did you start playing football? Garrett Lindholm: I began playing football in the seventh grade, but I wasn’t good enough to be the kicker. So, I ended up playing running back and corner back. TFFS: Who did were some of your favorite players to watch as a kid? Favorite team to watch? GL: Like most Texas kids I grew up watching the Cowboys and fell in love with the star players for Dallas like Aikman, Emmitt Smith, Irvin, etc..
TFFS: When did you first realize that you had a really good shot at the NFL? GL: I always thought I would make it to the NFL, even as a little kid because I was faster and more competitive than the older kids I played with. My Mom has a recording of me saying I’m going to play football in the NFL when I was around 5. Ever since then, my mind hasn’t changed, but the position I thought I’d be playing has. TFFS: I hear a lot about how kickers are often disrespected by their teammates for not being tough and not having to go out and get hit or hit someone. Has anything like that ever happened to go and if so, what was that like? GL: I would say it’s mostly the Offensive linemen who gripe the most about kickers because they are only jealous that they aren’t kickers. I’m not your average kicker though; I work hard every day and am just as fast and strong as most the guys on the team. Plus, I made 15 to 20 touchdown saving tackles since I’ve been here on kickoffs alone. TFFS: You made 3 of 4 kicks from 60 yards out at your Pro Day and that got the scouts really talking. Could you hit those type of kicks when you were say a freshman or sophomore or did your leg strength improve significantly over the course of your college career? GL: Distance hasn’t ever been a problem for me; it’s just controlling and making the right contact that matters now. Yes, I could have made those kicks my freshman year, but my leg has increased in strength as well. Other players watched me make a 74 yarder and hit the cross bar twice in a row from 75 my freshman year as well. GL: I’ve been blessed to have been contacted by a lot of teams. Our personal Pro Day only had one scout from the Dallas Cowboys, but at North Texas I think there was 17 scouts from 13 different clubs in attendance. TFFS: A lot of the things I hear around the league about kickers are this: They’re all the same. They’re unpredictable. They’re not important. What’s your reaction to this? TFFS: How familiar you are with the other kickers in this draft class, as you are coming from a small school? How would you compare yourself to them? GL: I have met a lot of this year’s draft prospects and have seen the rest on TV, but the good thing about kickers is the level of competition doesn’t matter. If you can kick, you can kick! I try not to compare myself to the other guys because if I do my best and train like I have since high school then it shouldn’t matter. I would like to think I match up pretty well with the best of them though. TFFS: Switching from you to your former team, what is one thing about Tarleton State football that you believe the common football fan aught to know? GL: That we are a scrappy team who never gives up and the score doesn’t matter in the end, but what does matter is who/what you played for (our teammates and our school). TFFS: Interesting question, how good are you at soccer? I know what a kicker does and what a soccer player does are not exactly the same, but do those skills translate? GL: I am actually a very talented soccer player and I had the opportunity to play in college, but passed it up to play football. I think most good kickers now days started off as soccer players. So, yeah the skill must translate. TFFS: Have you ever played another football position on any level? GL: I played outside linebacker, corner, and safety on defense and running back and receiver in high school. I mostly started at safety in high school, but would drop down in passing situation to linebacker to mirror the tail back. I didn’t play much offense, but was the punt returner and backup kickoff returner. TFFS: Have you ever had to hit a game winner in college and if so, what was the outcome and what was that like? GL: I hit one game winner last year with 3 seconds from 55 yards. To me it was just another kick and I had full faith in my snapper and holder, because they were the best. It was pretty exciting because we came back in the fourth quarter when nobody thought we could. It was pretty awesome to watch it sail between the uprights as time expired. TFFS: As a football fan, are you a fan of particular kickers in the league? I just find it interesting to see if a kicker has a difference experience of being an NFL fan because, you know, you don’t exactly see people at the mall or wherever wearing Jay Feely or Shayne Graham jerseys. GL: I’m a fan of each and every kicker, because they are where I want to be. I enjoy watching Jay Feely and Garrett Hartley kick because they look and kick similar to me, but watching Billy Cundiff kick from feet away in person made me want to be more fluid like him because he makes it look effortless. Maybe if I get in the NFL I could hopefully persuade some fans to wear my jersey. GL: I promise to work hard day in and day out to get better each day and I am willing to listen to coaches and learn from others so that I can better my craft. I won’t have issues on or off the field that would bring bad news to the organization and plus I can kick touchbacks and game winning field goals in pressure situations. I hit a 64 yarder as time expired to send a game to overtime in the first round of the playoffs. One of the things we like to focus on here at The Football Fan Spot, in addition to, of course, football, is the fan. However, when you are a just fan, it can be tough to understand what its like to be a player. To help us fans understand this is former NFL player Mikhael Ricks. He was drafted by the Chargers in 2nd round, 59th pick overall in 1998 as a wide receiver after 4 years as both a tight end and a wide receiver at Stephen F. Austin University. He spent 3 years in San Diego, and then went to Kansas City as a free agent in 2000 where he was converted to a tight end because of his size (6-5 260) and served as a back up to Tony Gonzalez. He only spent one year there before spending two years in Detroit. He spent 2004 on the practice squad in Dallas before retiring. He currently remains a huge fan of the sport, just like all of the fans reading this, and he’s here to talk about the NFL lifestyle through a few interview questions. The Football Fan Spot: When did you start playing football? Mikhael Ricks: I started playing football like most young Texan athletes when I was in 5th grade. I was on a Pop Warner team named the Anahuac Wildcats. I played for two years, and we never lost a game. TFFS: When did you realize that football was your passion, what you wanted to do with your life? MR: This may sound funny, but I didn’t realize I wanted to play football until my senior year in high school. I wasn’t a highly scouted player my junior or senior year in high school. Matter of fact there were four other guys that were doing things better than me at that time, I guess I became a late bloomer. When I saw how much attention they were getting from colleges, that is when I told myself I was as good or even better than them and started playing like that. My senior year in high school (Anahuac High), I passed for 1500 yards and rushed for 1200 yards in a wishbone style offense. I was recruited as an Athlete and went on numerous visits, committed to 4 colleges, and waited to the last minute to sign. I signed with Stephen F. Austin State University, and my first year there was a safety. Blew out my ACL my freshman year and redshirted. During my rehab, the coaches noticed how well I caught the ball, and moved me to a pass receiving TE. The next year I was the first TE in SFA history to have a 100 yard game. Unfortunately I tore my other ACL. It took me 3 months to come back from both injuries, which in the sports world is unheard of. During my college career I also separated my AC joint (shoulder). Going into my senior year in college I played receiver, and that year I had 47 catches for 1348 yards and 14 touchdowns. Going into my last game, I was averaging 35.9 yards a catch and ended up after the last game with a DII or (FCS) record of 28.9 yards a catch which I still think is a record today. I knew I had a shot when I had an agent come and stay in Nacogdoches for a week until I signed with him. He got me into the Kelly Tire Blue/Gray All Star Game where I was MVP and the Senior Bowl where I scored the only touchdown for the North squad. I went to the combine and performed well, and did even better on my pro day where I ran a 4.46 40 yard dash and a 4.18 shuttle drill. I guess after that is when I knew I had a shot. TFFS: What was your attitude about playing along some big names during your era? MR: I think that was the big thing with me when I got into the league was, “what am I doing here with all these other guys?” I came in the same year with Peyton Manning and Randy Moss, and I guess it was a big shock for me. I was confident that I could do big things, but when you come from a small school, I guess it is more of a culture shock than anything else. I had a positive attitude and just wanted to show everyone I belonged. TFFS: Did you feel that you were in the NFL and had a ton of talent just like the other big names and deserved that recognition too or did you feel like these guys were on a different level, the best in their sport and deserved that more than you? MR: I felt that I had just as much talent as they did, but when you come from a small school, sportswriters and columnists start saying that the competition level isn’t as fierce as the big schools and sometimes you start to question yourself. I knew I should have been there, but unfortunately I didn’t have the concrete teams, or coaches to help me develop myself into a better all around player and that is one of the things that still bugs me to this day. TFFS: What was an average week in the NFL for you? MR: Monday – is usually the time you come in and watch game film, take care of injuries, and do some conditioning and weight training to recover from Sunday. Tuesday-is the players off day. For some of the committed players, we did things around the community such as going to schools and doing speaking engagements, going to homeless shelters and help building homes for Habitat for Humanity. Wednesday & Thursday-were the official big time work days. In at 8am and by that time you eat breakfast and lift weights, by 9am you are in meetings putting in the game plan. By 10:30am you are doing a walkthrough. After lunch it’s time for practice which usually begins with special teams then you practice from 2 pm till 5 pm. After that you go through the practice film and finished at about 8pm. You usually have on pads or half shells these days. Friday-light day, usually Red Zone and 2-minute drill practice. Finished around 2 pm. Then the rest of the day is yours to tie up some loose ends and run errands. Saturday-you travel for away games, or come in early for a walkthrough, then meet at the hotel before the game. TFFS: What was your relationship like with your teammates? MR: I had a great relationship with my teammates. While in San Diego I stayed close with Junior Seau, John Carney, Rodney Harrison, and Natrone Means. Kansas City: Tony Gonzalez, Larry Parker, Troy Drayton and Warren Moon. Detroit: Az Hakim, James Stewart , John Owens, and Stephen Trejo. TFFS: What was your relationship like with guys who played your position, especially those above you or close to you on the depth chart? Did you feel yourself having to compete with those players for playing time, yet at the same time having to work together as a team to get what you wanted? If so, what was that like? MR: I never had an issue with any of the guys I played with. I guess the big thing for me was my rookie year when they released Tony Martin for me, now that was an uneasy position to be in. While in Kansas City, I played along the best TE in NFL history and we worked well as a team. I was usually used to clear routes for him, and I had no problem with that. He was a great teacher and a great fan. I just wished at that time that the offensive coordinator would have used me a little more. I think we would have won more games if I was involved more in the offense and that is just me being honest. My last year in Detroit I was benched for a player that played 6 man football, and that was the only time I resented playing football because I think I was more of a trying to “run Mikhael out of Detroit thing” than anything else. I think that is the reason I can’t stand the politics behind football or Steve Mariucci. TFFS: What was the NFL like coming in as a rookie, particularly your first few days of training camp with the entire team? Were you a bit star struck at first with all of these NFL players around you or did you feel like you fit in right from the start? What was the most important advice you received as a rookie and who was it from? MR: I was pretty star struck. I mean these guys went to the Superbowl a few years prior and I knew I was big but these guys were huge. You had Chris Mimms, Natrone Means, Freddy Jones, Jim Jackson, Aaron Taylor, Junior Seau, and Rodney Harrison and they were all over the place trying to intimidate you. The best advice I got was from a former SFA teammate and Charger Terrance Shaw was to just play like you did and do the things that got you here and you will be fine. TFFS: As you became a veteran of the league, how did your impression of the NFL change? Did it ever lose its luster, or did you still continue to get that, I’m in the NFL, I’m living the dream, this is amazing, kind of feeling? MR: It lost its luster for me I think the second year into my career. During my training camp, I had a note on my door talking about trade rumors, and how in the hell did this get on my dorm room door. No one in the organization could tell me and I thought that was foul. I was getting ready for a road trip and sitting on the bus, and my position coach told me I didn’t have to go to the game. So since I didn’t go to the game, I didn’t show up for team meetings on Monday because I was frustrated and I felt at that time that the coaches that were there weren’t man enough to talk to me. The next day I was released. In San Diego, these coaches were on the idea that it was good to switch receivers every other series, and it is hard to get in a good groove like that. Not to mention the guy I was switching every series could care less about playing. In Kansas City, I was brought in after being released as a wide receiver and found myself having to fight for a roster spot after a coaching change. That is when I asked Coach Vermeil to move me to TE and it worked for me. Now the situation in Detroit was the deal breaker. I came in as my first full time of playing TE and made the Pro Bowl. Now mind you when I changed over in KC the coach didn’t bother to coach me up because we had the best TE in NFL history, then after my first year I didn’t get coached up on blocking techniques. I also had micro fracture knee surgery and the Detroit coach insisted that I play with it and if I didn’t I wasn’t a team player. So I did, played terrible, and I was benched for it. When I came back healthy I was the second leading receiver on the team and was released for Stephen Alexander the next offseason because Mariucci thought he was a better fit for his West Coast offense. In closing this subject, I played 7 years, 5 of those with two broken fingers and that may explain the drops that plagued my career. I also played under seven head coaches and 12 QB’s in my seven years. Now how easy is it to get a groove in the league? Also when you play on teams that don’t use an audible system or tell you to run routes to clear out for other routes and don’t look back, but still have the ball thrown to you anyway? How do you become successful? TFFS: What was your retirement like? What were the feelings you felt at that time? Did you just feel that you didn’t have a place in the NFL anymore, or you lost the will to come back every season and try to make the team? Do you ever watch NFL games today and wish that you were back out there playing? MR: I do miss the NFL. I thought I went out to early and eventually thought I was “pushed out”. After all the moving and disappointment, I knew it was time. I guess I was just tired. Just looking back now at the people that are playing and especially doing the things I was doing its kind of frustrating. When I played coaches said you can’t be just a pass receiving TE and there is no such thing. I be damn it that is all there is now. Kind of ironic. TFFS: You’re no longer in the league, but do you still stay involved in NFL life so to speak, keeping in contact with current NFL players? Is football still a part of your every day life? What do you do now that you’re retired? MR: I do still speak with some of the fellow I played with, and living out here in San Diego, I frequently see a lot of them. I guess San Diego is the mecca for offseason football families. I connect with a lot of the guys on Facebook and Pro Player Connect. As of now I do train athletes as a Sports Performance Director for Velocity Sports. I also train players getting ready for the combine through Pro Prep Training. Also I train receivers and TE on route running and making sure they are living up to their ability to be the best they can be. TFFS: Looking at some of those players today, like, for example Michael Vick, Adam Jones, and Donte Stallworth, who make big mistakes, what do you think about them? Do you see their actions as completely inexcusable? You do understand at all why they would make those mistakes, how easy it could be to mess up like that in the NFL? MR: Every player has their own stories. Its hard to leave that old lifestyle behind especially when you have money and everyone thinks you owe them, or you are “leaving the old crew” behind. I think God puts people in certain situations to help teach everyone a lesson. Maybe Michael Vick needed a wake -up call and to put the awareness out there about dog fighting and how brutal it is. He is a great player and I wish the best for him. As for the other guys, you can throw Leonard Little in with that group I think just wasn’t thinking at that time and thought their celebrity status was going to get them through. My hat goes off to Roger Goddell for doing a great job in making examples of these guys. TFFS: Who are some of your favorite players in the league today and why? Do you follow a team today regularly? MR: As a player, I’m just a fan of football now and really no favorite teams just guys. Some of my favorites are LT, who I think deserves to be on a team that cares about him and get him a championship, Kevin Mawae, Jason Witten, and Donovan McNabb. Today at The Football Fan Spot, we have Brooks Reed, a defensive end prospect out of Arizona. Reed started 3 seasons as a defensive end at Arizona and was one of the premier pass rushers of the Pac-10. He was a team captain and is known for his non-stop motor. He stood out at The Senior Bowl and is widely regarded as a 2nd round pick lock, thanks to his experience, his motor, and his ability to play both a 3-4 and a 4-3 scheme. He has a bright future ahead of him. Today, he is here to tell us about his game and his Pre-NFL Draft experience. Brooks Reed: I started playing football at about the age of 8 or 9. I grew up watching the desert swarm at the UofA (University of Arizona) with Tedy Bruschi and co. I never watched that much NFL, mostly college on Saturdays. I knew I wanted to play in the NFL when I was young but I never realized my potential until later in college. BR: I had a great learning experience at the Senior Bowl. I had a chance to be coached by the Bills D-line coach, and really learned a lot in a short amount of time. It was nice to see how NFL coaches ran practice. The speed and intensity of practice was about what I expected, considering every player was trying to impress scouts and coaches. I also had a great opportunity to work with Barry Gardner, my linebacker position coach. I feel like I have come a long way with his help. TFFS: Which, if any, NFL teams have met with you up to this point? BR: I talked to a lot of 3-4 teams looking for a standup linebacker, and a few 4-3 teams looking at me as a D-end. BR: The lowest I have heard was 2nd-3rd round, but I try not to put too much into mock drafts. I guess I don’t want to get my hopes up. BR: I don’t really compare myself to anyone particularly, but I try to emulate my game after DeMarcus Ware, Dwight Freeney, Clay Matthews. TFFS: Which NFL players, if any, have been helping you through the draft process? BR: Earl Mitchell (former teammate of Reed’s at Arizona, a 2010 3rd round pick by the Houston Texans) has helped me through the process, mostly words of wisdom. TFFS: There is a very serious threat of a lockout in the NFL, how are you prepared to deal with that once you get drafted? BR: I am prepared to just stay in my home town and train until it’s over. BR: I would contribute versatility and the ability and desire to play special teams. I would say my biggest weakness is being comfortable dropping into coverage and pattern reading due to the fact that I did very little of that in college, but that is a work in progress. BR: I was a pure special teams guy in 2007, and just did punt team while I started at D-end for the remaining of my career. I love special teams, especially kickoff coverage. It’s something I take pride in. TFFS: The general consensus around your Combine performance was that it helped your stock. Were you satisfied with how you performed at The Combine or are there some things you wish you could have done a little better? BR: I felt pretty satisfied with my 40, but I felt a little disappointed with some of my other timed drills. I felt good about my position drills overall. TFFS: You got a chance to play in the Senior Bowl. What was that experience like? BR: The Senior Bowl was a great warm-up for The Combine, as far as interviews and competitive nature. It was cool playing with and against some of the best players in the nation. It really exposed things I need to work on at the next level. TFFS: Depending on who you ask, you had anywhere from 18 to 21 sacks in college. Did you have a favorite sack, one you remember more than the others? BR: One of my favorite sacks was against USC in 2008. It was a strip sack, and really was a momentum changer. TFFS: More and more teams in the NFL are switching to a 3-4 scheme. Both the Packers and the Steelers ran a 3-4, as did teams like the Patriots, the Jets, and the Ravens. How do you think you translate to a 3-4 as a so called “rush” linebacker? Have you played linebacker extensively before? Are you comfortable dropping back into coverage and rushing the passer from a 2 point stance? Is that something you’ve been working on this offseason? BR: I think I would translate well and I believe I have the athleticism to stand up and rush. I have zone dropped in college before and that was never really a big deal. I think the 3-4 rush linebacker is the best position on the field, but I feel like you have to be the most complete player, pass rush, play run and cover. TFFS: Something that really stands out to me about your game, and I’m not alone in this, is that your motor never shuts off, ever. That kind of thing is actually pretty rare in the NFL. Has this just been the way you’ve always played or something you’ve had to work at? BR: It is something that I really worked on in college, or when I made the position change to D-end. I have made a lot of plays with downright hustle, even with little technique. A great motor is essential for a defensive player, it’s all attitude. BR: I am a player that will provide versatility and a player that will give 100 percent effort every play. 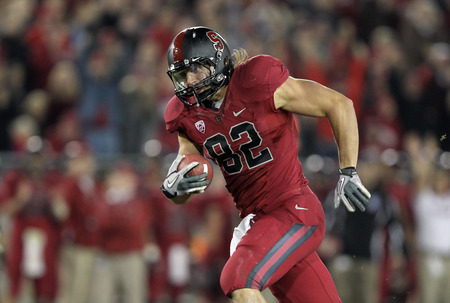 Today at The Football Fan Spot, we have Coby Fleener, a tight end prospect out of Stanford. He spent 4 years at Stanford as a tight end, starting for 3 years from 2009-2011. He and Andrew Luck hooked up for a team leading 10 touchdowns in 2011 and 17 touchdowns over the last 2 seasons. His 34 catches for 667 yards in 2011 put him 2nd on the team. At The Combine, Fleener benched 27 reps of 225 at 6-6 244 and though he did not run because of an ankle injury, he is expected to run in the 4.5s or 4.6s at his Pro Day, which would make him one of the fastest tight ends in this draft class. He’s a borderline first round pick who probably won’t make it out of the first 40 picks. He has a bright future ahead of him. Today, he is here to tell us about his game and his Pre-NFL Draft experience. The Football Fan Spot: First, a little bit of background stuff, when did you start playing football? Favorite team to watch? Coby Fleener: I started playing in high school. Growing up in Chicago, I was a fan of the Bears, but I wouldn’t call myself a die-hard. CF: I have been trying to get healthy and strong, as I suffered an ankle injury at the end of the year. It has been tough to not be able to train fully with my other teammates trying for the NFL, but my ankle is getting stronger. TFFS: Which NFL teams have met with you up to this point? CF: I have met with a lot of NFL teams and nearly all of the tight end coaches. I have only visited one facility thus far. CF: I don’t know where I will be drafted, but my goal is to be drafted as high as possible. TFFS: You didn’t get a chance to run or do drills at the Combine, but you have a Pro Day coming up. How have you been preparing for that? How is the ankle healing? CF: I am still working on my ankle, and trying to make it strong. I’ve been practicing the various drills and running routes in addition to weight room work. TFFS: Players always seem to get asked at least one weird question at The Combine. What was the weirdest one you were asked and how did you answer? CF: The weirdest that I can remember is, “When was the last time you did something wrong, knowing it was wrong, and you did it anyway?” I explained the story of me sneaking out of the house in high school. In hindsight, speeding was probably a more recent answer. CF: I think I can contribute in a variety of ways offensively and on special teams. I think every part of my game could be improved. I’m excited to just solely focus on football. TFFS: A lot of rookies have to play significant amounts of time on special teams. What is your experience playing on special teams? CF: I have played a good amount on almost all special teams. Most of my special teams playing was done in my first few years at Stanford, but I played KOR every year during my college career.